Like many urban areas that experienced dramatic growth after World War II, Santa Clara County grew up around the car. Now roadway traffic is creating problems for the county in terms of economic growth, social equity and quality of life. With the population expected to grow 36 percent by 2040, congestion and its negative impacts are only going to get worse. How can we get Santa Clara County, its people and its economy moving in a more sustainable way? By working to expand the range of available transportation choices, so that driving alone does not continue to be the only practical, reliable way to get around. The Santa Clara Valley Transportation Authority (VTA) is the agency best-positioned to lead this change. VTA does everything from planning and operating transit to constructing highways. The agency has the sophistication and expertise to create the South Bay’s sustainable transportation system of the future. 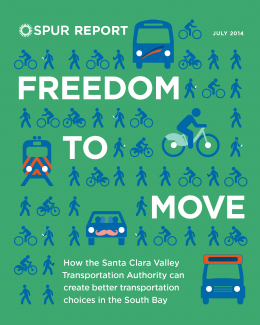 Freedom to Move offers seven strategies for how VTA can work with the towns and cities of the South Bay to deliver great transportation options. Freedom to Move is generously supported by the Silicon Valley Community Foundation and the John S. and James L. Knight Foundation. The SPUR San Jose City Board reviewed, debated and adopted this report as SPUR policy on March 28, 2014.